Nadar con tortugas = To swim with turtles in Akumal beach is something you can’t miss when you visit the Riviera Maya. It’s one of the funnest and cheapest things you can do in the area. Snorkeling gear (Goggles, snorkel and a salvavidas = life jacket. Fins are not allowed). It is mandatory that you wear a life jacket beyond the buoys. You can either rent one there in Akumal for $125 pesos ($6.02 usd) or you can bring your own. If you are in Playa del Carmen, the cheapest and best way to get to Akumal is by colectivo = collective van. Colectivos go from downtown Playa del carmen all the way to Tulum, and it is $35 pesos one way (~$1.70 USD). Let the driver know you are going to Akumal and he will drop you off on the side of the road. From here, you need to cross over the highway on the bridge and walk to the playa = beach. If you bring your own snorkeling gear, ignore everyone who is going to try to sell you a tour on your way to the beach. We have also heard of people claiming that you need to pay in order to enter the beach in Akumal. Do not give them any money, the beach is free to visit and it is also free to swim with the turtles. When you are at the beach you will be asked to read a sign about the most important rules for keeping the turtles and yourself safe. Rule number one: do not touch them. Turtles in Akumal beach may be used to people swimming by them, but this doesn’t mean that we can get as close to them as we want to. Keep a respectful distance of at least 6 feet when swimming with sea turtles. Touching or harassing them increases stress in turtles, disorientation and possible changes to their feeding habits. Rule number two: only wear biodegradable, eco friendly sunscreen when you visit any natural ecosystem. Think about all the chemicals that get deposited in the water from the millions of tourists who visit these places. Imagine how dangerous it is for the fish and other creatures to be living among such chemicals. If we want to preserve these species, we have to make sure we help by using safe sunscreen. Rule number three: Do not litter! Leave with everything you came with. Plastic represents a big threat to sea animals and it is our responsibility to keep their home free from trash. If you are going to Akumal with your friends it is best to tomar turnos = take turns swimming and watching over your stuff. Never leave your belongings unattended. I have had things stolen for thinking nothing will happen. Now, the sea in Akumal is divided by sections and it is important to know that there are some areas of the water you cannot access without a licensed guide. The shore is open for everyone who just wants to swim and relax in the water. No gear needed. The second section of the sea is where you need to wear a life jacket. This is where most of the turtles hang out. You do not need to hire a tour guide to get to this part of the sea. The third section of the sea is reserved for groups with licensed tour guides and divers. There are people patrolling the water making sure everyone respects these limits. When you are swimming with the turtles be careful of other sea animals you may find there. Remember that you are in the habitat of many animals, and if turtles can get there, other animals can too. We saw many little peces, tortugas y una manta raya = fish, turtles, and a stingray. Once you are ready to go back to Playa del Carmen, just walk back to the highway and wait for the colectivo. 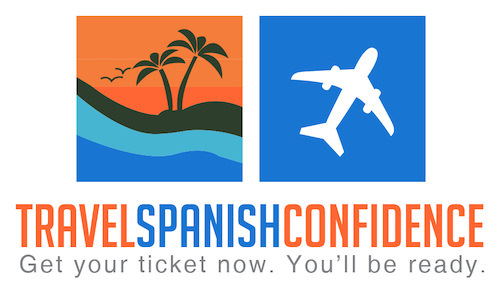 Now you have all the tips and information you need to plan your next adventure, plus some very useful basic Spanish vocabulary for your trip. We hope this article was informative and helpful. We also have a video with the most important information for your trip and footage of what we saw in Akumal beach. Have you been to Akumal? Have you swam with any other sea animal? Let us know in the comments!